This one covers what we typically call the Television Crossover Universe, though I also call it the Horror Universe in the Horror Crossover Encyclopedia and the Live Action Universe in the Cartoon Crossover Encyclopedia. It's the reality of the live action movies. It's a very separate timeline from the others, although some things that happened in the cartoons also happened here. One major difference you will notice is that because this centers around the live action films, the dates of some entries are not the original air dates, but rather dates that make sense if we assume the live action films were contemporary. 218–202 BC--CABIRIA--The temple monster design comes from this film. This series features MACISTE, who has his own crossover chronology elsewhere on this website. The Story: A scientist creates a formula that unlocks his dark side. Notes: Unlike with Dracula and Frankenstein, I consider the Universal film version of this to be the same events, rather than having hundreds of Hyde variants out there. 1954--DEVIL MAY HARE--This is the first appearance of the Looney Tunes Tasmanian Devil in a Bugs Bunny cartoon. 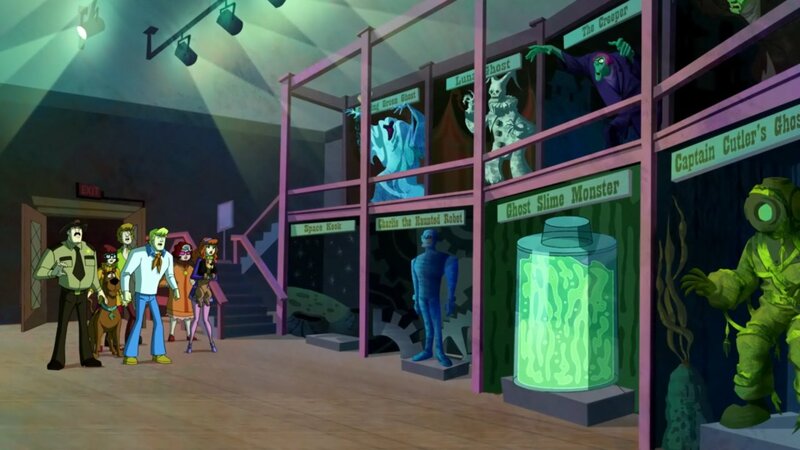 In Scooby-Doo 2: Monsters Unleashed, Scooby goes through many physical alterations using Hyde type formulas. One of his transformations is into the Looney Tunes style Tasmanian Devil. 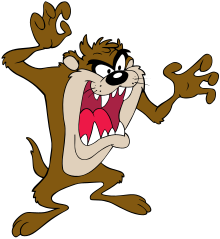 From Tas-Mania, we know all Tasmanian Devils in the Looney Tunes series look alike, so in the Live Action Universe, unlike the real universe, Tasmanian Devils look like Taz. So no, Scooby didn't turn into THE Taz who has menaced Bugs, but the appearance of a Tasmanian Devil looking like Taz means to me that the original Bugs/Taz cartoons are actually in the Live Action Universe! What? A talking rabbit in the Live Action Universe? That's as ridiculous as a talking dog. Note I'm not bringing all of Looney Tunes in, though, but the original Bugs shorts could be in, perhaps. 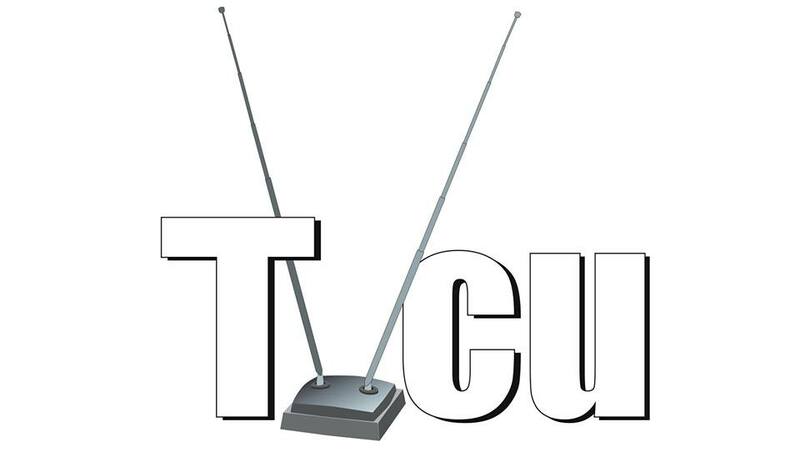 The TVCU is a pretty silly reality. Also note that Looney Tunes: Back in Action CANNOT be in this reality despite what I may have said in other posts and in the Horror Crossover Encyclopedia. In Back in Action, Scooby and Shaggy are animated, and animated in the same Toon theory way as in Roger Rabbit. And also in Back in Action, the live action Scooby films are specifically referenced to be fictional movies. 1961--THE BEAST OF YUCCA FLATS--A "miles to Yucca Flats" sign appears where Scrappy-Doo gets thrown out of the Mystery Van. 1974--HONG KONG PHOOEY--Shaggy [to Scooby; after getting hit in the face]: Hong Kong Phooey, watch the fists of fury! 1992--A PUP NAMED SCOOBY-DOO--This is questionable. A flashback in Scooby-Doo 2: Monsters Unleashed shows a flashback to their pre-teen era from this series. However, Scooby-Doo: The Mystery Begins has them forming the team a few years after this in their mid teens. Perhaps they had some adventures, then went their separate ways, then later reunited? Note also A Pup Named Scooby-Doo was the first time the gang's hometown of Coolsville was named. 1996--SCOOBY-DOO! THE MYSTERY BEGINS--A new origin for the group, which contradicts Pup, which was referenced in Scooby-Doo 2, but also is a prequel to the 2002 live action film, so... The gang seem to be 15 with Shaggy a year older. He's in the team because he is the only one who can drive and has a van. It should be noted it is Shaggy's van, though when Fred gets his license, he ends up doing all the driving. A Huckleberry Hound bobblehead is on the dashboard of the van. Probably this means other HB characters are not real in this reality. They are fictional characters. The Story: When drilling wakes the goddess Gaia, she realizes the planet, which is directly connected to her, is in danger, and sends five rings to five teenagers to become Earth’s protectors, the Planeteers. The rings individually each have a single power, over earth, wind, fire, water, and heart. But when those powers combine, they can summon the super-powered being Captain Planet. Notes: Just a few months ago, the Live Action Universe’s Gaia also nearly died, as seen in the Earth Day Special. The Story: The Planeteers go undercover to stop a gang war. Notes: At the school the kids are going “21 Jump Street” at, Velma and Shaggy from Mystery, Inc. are seen at the school in the background of one scene. I don't recall if this episode named the setting. Could it be Coolsville, or are Mystery Inc here on a case? Or are Shaggy and Velma there for some other reason? The air date of this episode would place this prior to where I'm placing Where are you, but I'm going to fudge it and say this takes place in May 1996, not 1994. Summer 1996--SCOOBY-DOO! CURSE OF THE LAKE MONSTER--Sequel to the prequel. This film takes place on their first summer break after forming Mystery Inc, but still before Where Are You. This film supports my theory that the team does most of their travelling mysteries while on school vacations, which makes sense since they are teens but most of their cases take place all over the country and the world. In the end of this film, the clown and tiki ghosts from the opening montage of Where Are You appear. Since those didn't actually appear in Where Are You, except in the opening, it adds to the chronology that this takes place prior to Where Are You. Fred and Daphne wear their "classic" outfits for the first time, by grabbing cloths off of mannequins. Fred, a brunette in the prequels, even dons a blonde wig like his hair in the original cartoons. This helps explain the 70s outfits they wear in the cartoons if those cartoons are moved to the 1990s and explains them wearing those clothes still in the opening of the live action film which takes place in 2000. Clearly that moment gave them the idea to wear those "retro" outfits as part of their mystery team gimmick, and inspired Fred to change his hair as well. 1996--FROM DUSK TILL DAWN--The monsters explode in a similar way the Vampires explode using a disco ball and sunlight. probably around 1997--SCOOBY-DOO, WHERE ARE YOU! (ANIMATED SERIES)--A group of teenagers and their talking dog go around solving mysteries which always involves debunking a fake haunting. Yes, Scooby is in. And the series should be in. It’s got the crossovers, and it’s about kids going around debunking the supernatural. It is a horror series for kids. But we’ve got two issues. So let’s talk about the talking dog in the room. Scooby is an intelligent talking dog, and yet, in all the travelling and meeting new people, nobody is freaked out by a talking dog. In Mystery Incorporated (set in a divergent timeline), it’s revealed the Scooby is descended from aliens who had been worshipped as gods in Egypt and eventually interbred with Earth animals. The second issue is the one we have with comics. These kids don’t age. They are eternally high school seniors, at least through this initial first series. But that doesn’t work in a universe where most characters do age normally. Each Scooby-Doo series is looked at independently, and some are in and some aren’t. In some later series, the kids are older, but not as old as they should be considering their setting remains contemporary. (As in the 1970s stories where they are teens are set in the 1970s while their 2000s stories where they are in their mid 20s are set in the 2000s.) I will address the issue again for each series entry and how I choose to resolve the issue. But for this series, I think it best to place the events as taking place in the summer before their senior year, and then weekends and school breaks throughout their senior year. (After all, they do a lot of travelling for high school students.) And that’s the best I can do. If anyone comes up with something better, I applaud you and suggest you apply your solution to your shared universe. 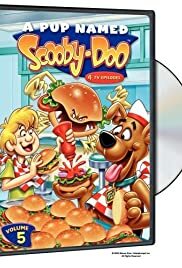 This series is followed by The New Scooby-Doo Movies in 1972. It was remade as a live action movie in 2002. The series has been referenced and spoofed numerous times in film and television. We know that this series is canon with the live action films because there are so many references to the original series and the second film mentions several villains from this series. Notes: This episode places the original Jekyll and Hyde as real, and thus Scooby and gang end up pulled into the Horror Universe. Probably set around 1998?--THE NEW SCOOBY-DOO MOVIES (ANIMATED SERIES)--Mystery, Inc. continues to solve mysteries, but now they meet a lot of interesting people. See my Notes for Scooby-Doo, Where Are You? for how I feel about talking dogs in the Horror Universe. There are many Scooby-Doo series, and some have contrary canon. For that reason, each one is considered separately for crossover inclusion. Where Are You? and this series are referenced in Scooby-Doo (2002) as being part of the past of the film's canon. This series is a continuation of Scooby-Doo, Where Are You! It continues in 1976 as The Scooby-Doo/Dynomutt Hour. It was remade in 2002 as a live-action film. This series also spun off the animated Harlem Globetrotters series. The series has been referenced several times in other series and films. It has also been spoofed in Gremlins 2, NIght of the Living Doo, and Family Guy. This series had many guest stars. Some were fictional and others were contemporary celebrities. Since this has been moved forward to the 1990s, we can presume that the guest stars may have been instead either different more modern guest stars or older versions of the original celebrities or even perhaps the children of those celebrities. As for the fictional characters, I'm not going to count those crossovers in this timeline. A lot of those crossovers don't work when we shift the timeline. Note that in other cartoon timelines, the stories remain exactly as seen on TV and in their original contemporary timeline due to how comic book/cartoon time works. It's still a safe bet that this series is in canon at least in spirit with the film as the film opens up with Mystery Inc. solving a mystery for special guest Pamela Anderson, in the classic tradition of the New Scooby-Doo Movies. I will cover these omitted crossovers in the blog posts for the other series involved in the crossovers, to try to explain how they can still fit in the TVCU or if they must be placed elsewhere in the Television Crossover Multiverse. 1998 to ?--POWERPUFF GIRLS--The Powerpuff girls are referenced by Scrappy in Scooby-Doo as being real. They debuted in 1998 and in the series have remained kindergarteners, because cartoon time. So I'm going to say they debuted here but either aged normally in the Live Action Universe or else they maybe don't age since they were artificially created in a lab? 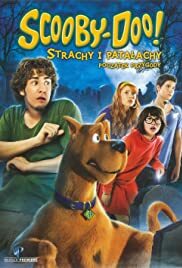 Probably set in 1999--SCOOBY-DOO AND SCRAPPY-DOO (ANIMATED SERIES)--The Mystery, Inc. gang gets joined by Scooby’s very hyper nephew Scrappy-Doo. This series was a continuation of the previous two series mentioned (Scooby-Doo, Where are You? and the New Scooby-Doo Movies). All of the various incarnations of Scooby are brought in separately. In this case, Scooby-Doo and Scrappy-Doo is brought in by Scrappy's appearance in the live action film. In this series, Scrappy gets added to the cast to boost ratings, which were slipping. As if it wasn’t hard enough to explain Scooby, we now are faced with an unaging puppy who is more articulate than his uncle. 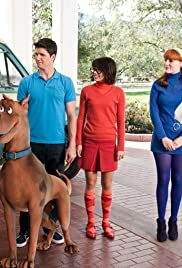 The Scooby-Doo live action film does at least offer an explanation that Scrappy wasn’t a puppy, but merely suffered from a pituitary gland issue. And of course he can talk because talking dogs are normal. Actually, Scrappy is part of Scooby’s family, descended from aliens that posed as gods and interbred with Earth animals. This show is continued into the 1980 Richie Rich/Scooby-Doo Show. 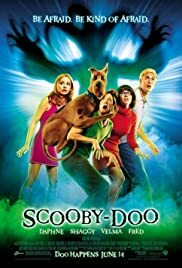 This series is spoofed in the 2002 live action Scooby-Doo film and has been referenced as fictional and in homage in numerous films and on television. For the Live Action Universe, this is probably the last of the Scooby cartoon series that counts. Notice we skipped the Scooby-Dum and Scooby-Dee era and the Laff-A-Lympics because they aren't referenced in the films. Later animated series have the gang splitting up, with only Scooby, Scrappy and Shaggy having adventures, then later Velma returning now a journalist. None if this seems to have happened in the canon of the films. When the film starts, the gang is still together and then split up for the first time. And Daphne is not a journalist. 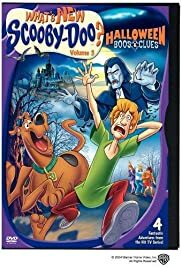 Also, the film shows in flashback Scrappy being ditched by Mystery Inc when they are still together, but in the Saturday morning cartoons, they split up and Scrappy remained with Scooby and Shaggy. Please be aware that a lot of what I'm counting and not counting contradicts previous TVCU posts and the Horror Crossover Encyclopedia. That stuff is out. This is in now. That's why we have the seven timelines now. It makes more sense. Notes: Because of the appearance of the Mystery, Inc team, and not as 40-somethings, this must be the team from the live action films that started with Scooby-Doo (2002). This film series continues with only three of the original cartoon series as canon. In Scooby-Doo (2002), the gang are all young adults. So the “kids” here are now in the early 20s, in a time period that is contemporary with release dates based on pop culture and technology. May 1999--The gang graduate from high school. Summer 1999--This is probably when the team ditched Scrappy. 2000--This is the opening of the 2002 Scooby-Doo film. The gang help Pamela Anderson solve a mystery but a fight ensues after that leads to the team breaking up. Note they take down the Luna Ghost, who has never appeared in the cartoons, but returns in Scooby-Doo! Mystery Incorporated. Mystery Incorporated however is a divergent timeline where the kids are still in high school and had some adventures similar to the original cartoons, but live in Crystal Cove, not Coolsville. Notes: One of the inhabitants is Brutus, who is a creature of the Frankenstein model. Brutus’ wife is a Gill-Woman named Nessie. Edgar is a raven who claims to have been the inspiration for Edgar Allan Poe’s story. The Boneyard has its own elected official, Mayor Wormwood. Mayor Wormwood is supposed to be Satan, but this Satan is kind of an idiot. I’ve stated elsewhere on this website that not all appearances of the devil are the same guy. The name carries weight, and so it seems that many lesser demons may pose as the top dog. In the Screwtape Letters by C.S. Lewis, Wormwood is a poor excuse for a demon who is eaten by his uncle. But of course, what happens when a demon dies? They return to Hell. So this may be the same Wormwood. The vampire named Abby seems to be of the vampiric variety seen on Buffy the Vampire Slayer. Remember that in the Horror Universe, there are several strains of the “vampire virus”, which create varying types of vampires with different traits, strengths and weaknesses. Abby refers to Michael as her “Renfield”. That could be a pop culture reference, but considering the number of other horror crosses, and that Dracula is real in the Horror Universe, I’m inclined to count it. There are “Xandorian” demons which I believe to be an intentional misspelling of Kandorian demons from the Evil Dead series. Somebody refers to the original Dr. Frankenstein. That same person makes a reference to that guy with the stick which may be Larry Talbot, whose cane is famous. At a bar is Zatanna Zatara and a Gill-Man. An Old One appears, who is friendly! His name is Haz’aroth, which may be an intentional misspelling of Azathoth, but I’m not sure Azathoth would be so nice. Perhaps he’s a nicer guy around other monsters. Abby is hired by the government to stop a slasher at a summer camp called Camp Waterlake. Though the slasher turns out to really be Lilith, she has taken the form of Jason Voorhees. This isn’t the first time Camp Crystal Lake has changed its name. In the film series, it did so to try to avoid the bad reputation it has gained. When Abby has to attend a banquet for supernatural beings, she takes Michael as her date. The waiter is Ariel from Shakespeare’s the Tempest. Hellboy is in attendance. So are King Ghidorah and Mothra. The Space Kook is also there. Though the Space Kook was just a man in a mask in Scooby Doo, Where Are You!, most of those villains took on the identities of figures from legends and folklore. So this must be the real Space Kook that inspired the man in the mask who was exposed by Mystery, Inc. The Story: Two years later, all of the team members are reunited to solve a mystery on a horror themed island. Notes: This film takes place in the Live Action Universe, which is also the Television Crossover Universe and Horror Universe. This is a separate timeline than the other Scooby animated and comic book timelines which we cover elsewhere on this website. Scrappy is kicked out of the van in flashback near Yucca Flats, which is a real place, but the reference here was to the B horror film starring Tor Johnson as the Beast. The monsters explode in sunlight just like the vampires from Tarantino's From Dusk Till Dawn. Scooby's dog collar prop from this film appears again in Slither, in a pile of dog bones. James Gunn directed Scooby-Doo and Slither. Shaggy references that he fights like Hong Kong Phooey. 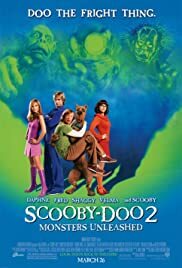 This film is meant as a direct sequel to Scooby-Doo Where Are You, New Scooby-Doo Movies, and Scooby-Doo and Scrappy-Doo and references in the film make that clear. Scrappy mentions the Powerpuff girls. The Luna Ghost first appears in this film and reappears in Scooby-Doo: Mystery Incorporated. The temple is designed to resemble that seen in Cabiria, the first film to feature the hero Maciste. 2002 to 2004--WHAT'S NEW, SCOOBY-DOO!--This new updated version of the team aired following the live action film. In this series, they are now wearing modern clothing, rather than their 70s outfits. Though the first live action film has them in classic garb, in the second film they also wear modern garb. In the prequel, Scooby-Doo! The Mystery Begins, the ending credits are accompanied by the theme to What's New, Scooby-Doo. Notes: Sequel to the 2002 live action film. Scooby transforms into the Looney Tunes Tasmanian Devil after ingesting a formula. There is a flashback to their early days from A Pup Names Scooby-Doo. Additionally, the setting of this film is in the gang's hometown of Coolsville. In the classic cartoons, the gang was always travelling. A Pup Named Scooby-Doo was the first appearance of Coolsville. Many classic foes from Scooby-Doo Where Are You appear or are referenced. A janitor is auditioning for So You Think You Can Dance. 2005--SO YOU THINK YOU CAN DANCE--In the second live action film, the janitor is making an audition tape for this show. I know it's a reality show, but it's interesting that the reality show didn't air until a year after the second film, which means that the janitor was auditioning for the premier season. Clearly he didn't make the cut. The Story: An alien invasion commences via a hive minded race of worms that possess the planet’s natives. The Story: Ever since he was humiliated in public by his girlfriend on Christmas, Allen Karroll has come to hate Christmas. He also hates his mean neighbor Zed Rosecog. On Christmas Eve, Allen gets visited first by Jacob Marley, then by the ghosts of Christmas Present, Past and Future. The problem is they went to the wrong address. They were to visit Mr. Rosecog, and thus show Allen Mr. Rosecog’s present, past and future Christmases. Despite this, Allen still learns a lesson about the Christmas spirit and how his own life has been intertwined with his neighbor’s.